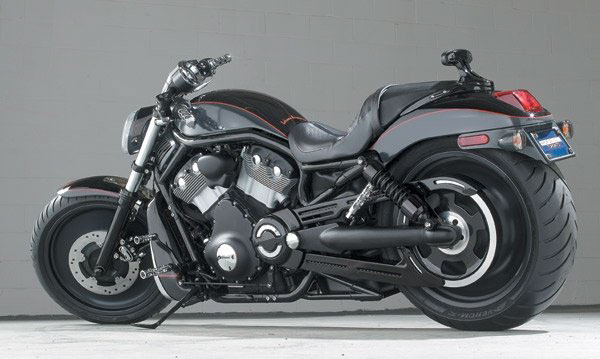 2004 V-Rod. The Very First 'Blacked Out' Bike. They call Canada “the Great White North”. A land of snow capped mountains and winter vistas; home of the caribou and the polar bear. Perhaps, when you think of a place where great motorcycle styling innovation is born, Canada is not the first place that comes to mind. Maybe it’s not even in your top ten. But just outside of Canada’s largest city, Toronto, there is one man, who just may be more influential than anyone is ready to give him credit for. Meet Marc Frantz, a Harley-Davidson dealership manager in the city of Kitchener, Ontario. Whether you know it or not, or choose to believe it or not, you have probably seen Frantz’s motorcycle visions more than once in your life. Since 2002, Frantz has been customizing stock Harleys, using an innovative approach to design through unique styling cues and custom color coatings that are grabbing the attention of everyone from the budget builder up to the design team at the motor company itself. Frantz is soft spoken, utterly sincere in his speech and presence and a well reputed man-of-his-word. It is his aura of humility that first grabs you. And when he shares the depth of his creative muse with his customers, they can’t help but be infected with the customizing bug. It was this personal appeal that took Marc from a reasonably successful, albeit mainstream managerial position in the automotive industry, to a shot in cutting edge computer software research and design. However, the digital dream came to an unexpected end with the tech bubble burst and Frantz was left looking for work. Following his passion for motorcycles, Frantz found his first job with the motor company in Toronto and began to climb the corporate ladder. It was in Toronto where Marc first achieved notoriety. His personal ride at the time was a 2002 Heritage Softail which he had crafted into a unique thing of beauty. So beautiful in fact that the custom pan heads, chrome accents and 2-tone retro color scheme using Lamborghini factory paint caught the attention of a local television personage. When famed builder Jesse James came to town on a promotional tour, Frantz’s Heritage graced the background of the shot during James’ interview. Footage would be later aired across North America of Jesse James autographing the back fender of Frantz’s bike. Figuring that his 15 seconds of fame were almost used up, Frantz presented a CD ROM of pictures of his Heritage to H-D executives at a 2003 dealer meeting to show what Canadians were doing that was new and unique. "Anything I could do to help the motor company prosper, in my little way" says Frantz. At a 2004 dealer meeting, a colleague ran up to Frantz and told him that his bike, meaning the Heritage, was on the floor in the conference center. When Marc spied that bike, his jaw dropped. What he saw was the new FLSTN, also known as the Deluxe. The styling cues bore a striking similarity to Frantz’s custom design. But the retro paint scheme was a dead match. With feelings of flattery and honor, Frantz contacted the motor company to thank them for this recognition, albeit a quiet one. “As a Harley employee, I am totally aware that Milwaukee has its people looking for new products to add to their aftermarket line. I just never thought that they would adopt pretty much the entire design theme.” Nonetheless, Frantz was touched by the 'private acknowledgment'. In February 2004, Frantz sat in his dealership office wondering how he could market the new V-Rod. The show room had more than one of the all- silver first year models and the store room had several others. The local buyers were just not biting at the innovative (for Harley) liquid-cooled, brushed aluminum machine. But Marc’s muse saw something radical. He purchased a V-Rod and stripped the bike to the bare frame. From there, Marc sent pieces out for paint and powder-coat, strategically selecting parts for flat black, gloss black, and black crinkle coat, adding just the right touches of red and chrome. 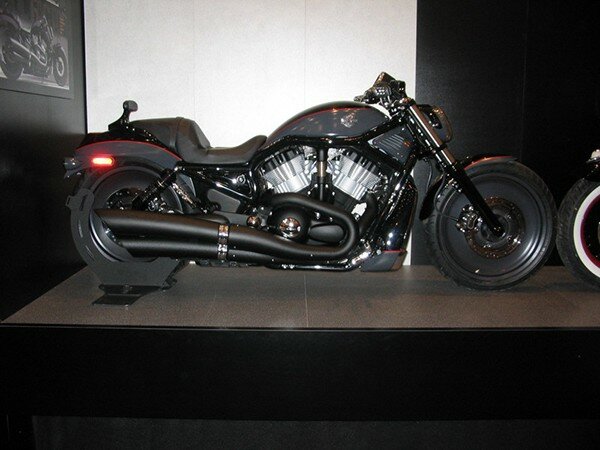 In December 2004, Marc’s V-Rod was unveiled at the Toronto Auto-Show. The local acclaim for the blacked-out V-Rod impressed Frantz to pursue further promotion of his new design. Once again, Marc’s bike graced the background as Sarah Harley and Jean Davidson were interviewed on Toronto television while promoting their book. At the January 2005 H-D dealer meeting, Frantz handed a CD ROM containing professionally shot pictures to H-D vice-president of styling Willie G. Davidson. "I did this for him" says Frantz. "I asked him in San Diego what aspirations he had desired for 'his' company, and he told me that he wished the 'kids' would start embracing the brand as much as us baby boomers have, so this was my idea, hoping to attract the twenty & thirty somethings to the venerable marque". 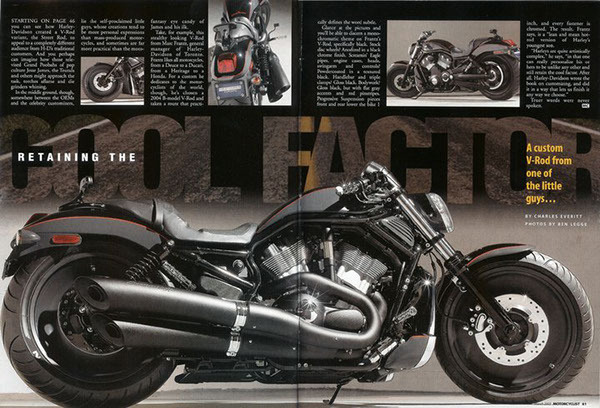 The March 2005 issue of “Motorcyclist Magazine” featured Frantz’s black V-Rod and first introduced Marc in print as a designer of vision. Subsequent editorials from readers noted that Frantz had something special in his slick, black rocket. 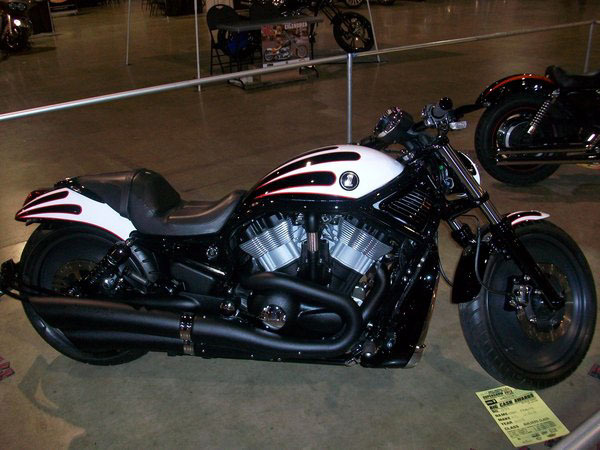 In late 2005, the motor company introduced the Night Rod Special Edition as an early 2006 model. Frantz was ecstatic that he had provided the infuence for two production models. Some Harley insiders were candid with Frantz. They told him that they had indeed blown up one of the photos from the magazine story to a 4 foot by 8 foot poster and hung it in the design room, using it to analyze my design when they mocked up their prototype. "Awesome!" says Frantz. "I wanted to contribute towards the growth and strength of a company I genuinely care about". "I'm happy to have done it". 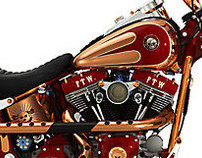 The attention to detail in the copper chopper is awe inspiring. “There are seven colors in the bike. People, including my painter, thought I was nuts to use so many colors. They figured it would look like a gaudy clown.” But great artists are always misunderstood, aren’t they? Frantz’s untraditional use of copper plating on the frame coupled with Harley skull-motif design cues in blood red, powder blue, white and black hit the onlooker like a punch in the mouth. When they recover wide-eyed, they can’t help but say, “Wow”. 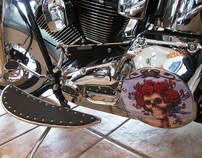 Frantz even used Harley-Davidson skull-motif belt buckles as design pieces on the gas tank and sissy bar. But the true test of Marc’s vision still needed to pass the test of public scrutiny. So Frantz packed up the copper chopper and headed to Bike Week in Daytona. 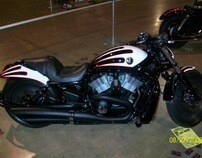 Frantz also entered the bike in the Harley Davidson Corporate Show taking an honorable mention 3 rd place. Willie G. and other Davidson family members spent considerable time with Marc picking his brain about his design over the course of the show. “Largely, they were interested in my use of color coatings and the skull-motif belt buckles I turned into design pieces for my build.” "Willie G christened me with a nickname, he called me the Copper Kid!" "I was just blessed by Willie G!" he exclaims, "What can be better than that!!". So what’s next for Frantz now that he has returned to his home in the Great White North? “Cyril gave me some great advice and told me to build my reputation one bike and one customer at a time. My first customer asked me to make his 2002 Heritage into a rerto-bobber. It’s going to look like a 40’s hot-rod, returning to the original days of cool. Another customer just bought a Night Train and dropped another ten grand to let me customize it any way I wanted to.” Now that shows confidence in your builder. Marc Frantz is not an engineer. He doesn’t form his own frames or auto-cad new billet wheel designs. He doesn’t mill engines and he doesn’t design new technology. Nor is he a fabricator in the sense that he doesn’t pound his own parts out of sheet metal or weld them together. And still, he’s not a big money designer piecing together six-figure customs. But he is a designer of the most unique sort. If the super-builders were like the great classical and impressionist painters of the art world, Frantz would be an under-rated master of watercolors. For what Frantz does most masterfully, is express the fullness of his motorcycle vision by designing within the limited pallet of the commercial aftermarket such as is available and affordable to anyone that can finance an off-the-floor Harley. And in the end, is that mastery not just as or more important to the consumer than the fabricators on the cutting edge? In the end, did Marc Frantz with his 2002 Heritage inspire the design of the Deluxe? 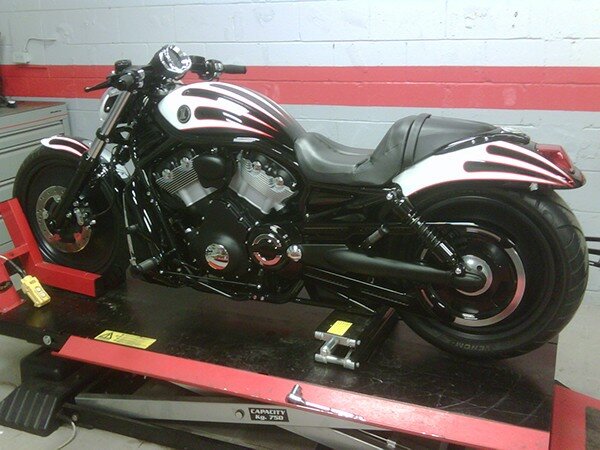 Did he, with his 2004 V-Rod inspire the Night Rod Special Edition? Harley won’t say, but public and media attention of late may be forming an opinion to the affirmative. But if the motor company’s recent gobs of attention to Frantz’s copper chopper design and those follow-up conversations mean anything, and if the motor company does end up following Frantz’s suggestion to release colored frames and accessories, then we just may have to collectively acknowledge this: Marc Frantz may be a true design leader to whom Milwaukee has repeatedly looked to for inspiration. And if that turns out to be the case, Frantz may just be one of the most influential designers in the American motorcycle mass market today. With Frantz’s innovation and use of color, the Great White North may never be plain white again. The December 2004 International Auto Show where it was first shown to the public. The crowd was so large around the bike, that the Ferrari booth complained as to why a motorcycle is at the show. Does one really have to explain? 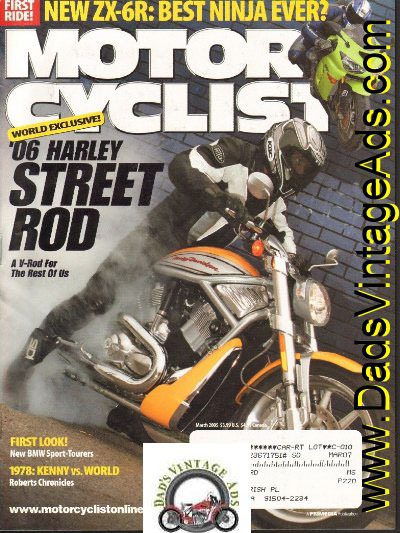 The March 2005 issue of Motorcyclist Magazine, where my V-Rod was first shown to the world. 2012, A little color comes to the original 'Dark Knight'. I wanted to see what an 'old school' scalloped paint theme would look like on a modern bike. It worked and looks just like the image I had in my mind. I have another portfolio on this 'Re-Dux' process. The finished product at the 2012 Toronto Motorcycle Show. The response was phenomenal, and the bike was sold. Perhaps we will see this new color treatment offered as a custom paint kit in the future, from the Motor Company. This was created for Willie G. Davidson. It wears his signature 'Willie G Skull'. The Jennings Flyer. A tribute to Jennings Wardlaw. Forever Two Wheels: The Cyril Huze Tribute Bike. Projects for Customers & Industry. Created in 2004. Currently being re-painted and updated.